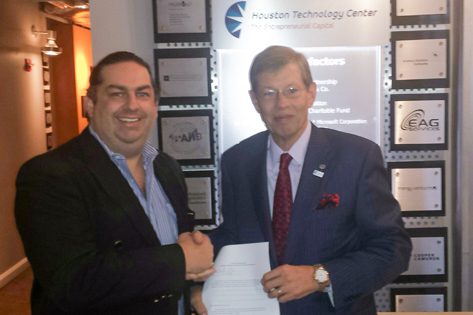 LOS ANGELES, CA - 12/11/2015 - Walter O'Brien, Executive Producer and the inspiration behind the hit CBS show, Scorpion, and founder and CEO of international consulting firm, Scorpion Computer Services, has joined the board of non-profit technology and entrepreneurship incubator, Houston Technology Center. Named by Forbes' as one of "Ten Technology Incubators Changing the World," the Houston Technology Center provides education, insight, and access to capital that entrepreneurs need to move towards the path to commercialization. The Houston Technology Center is a hub for speakers events, technology and innovation showcases, with sponsors that include Chevron, Comcast, AT&T, Shell, and Reliant Energy. Said Walter Ulrich, CEO, Houston Technology Center: "Walter O'Brien's addition to our board of directors adds distinctive expertise and deepens our leadership bench. Walter is a world-renowned cybersecurity expert and technologist. His inventions, including ScenGen, have had a number of commercial applications that will further inspire the Houston innovation." After a unanimous vote to add Walter to its board of directors, O'Brien said, "I look forward to making tangible and inspirational contributions to the Houston Technology Center's initiatives. HTC is an engine behind Houston's and Texas' continued growth." Named by Forbes' as one of "Ten Technology Incubators Changing the World," and as one of "Twelve Business Incubators Changing the World," the Houston Technology Center is the largest technology business incubator and accelerator in Texas, advancing the commercialization of emerging technology companies in the greater Houston area. HTC serves as the nexus of new ideas, technological innovation, and entrepreneurship. Each day, the staff and partners of the Houston Technology Center work closely with entrepreneurs and startup companies providing them with in-depth strategic and tactical business guidance, fundraising advice, and connecting them to opportunities, allies, and capital. As a catalyst for change, economic growth and development, HTC's focus is to assist in the acceleration and commercialization of emerging technology companies. Each company is treated individually according to their position in the Acceleration Pathway and their unique needs. As a 501(c)(3) nonprofit organization, HTC assists Houston-based entrepreneurs within several key sectors: energy, information technology, life sciences, nanotechnology, and NASA/aerospace.